Five-game winning streaks don’t happen on their own in baseball, even against inferior opposition. So as the No. 16 Cardinal takes that momentum into a measuring-stick home series with No. 23 Texas this weekend, Stanford will look to remain potent at the plate against a Longhorn team making its first road trip of the season. The Cardinal (6-2) launched five homers in its last four wins — it had none in the first four games of 2013 — and has scored seven runs in three consecutive games, while Texas (6-2) is coming off a 5-3 midweek loss against Sam Houston State. 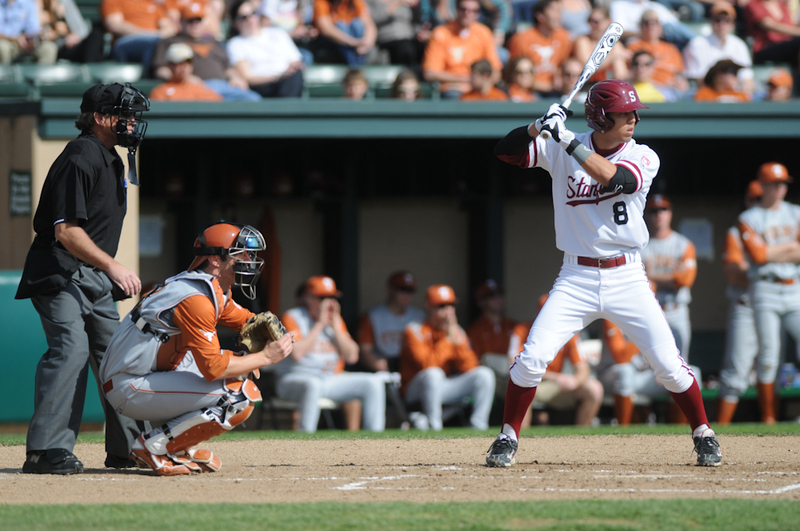 Stanford hasn’t lost a nonconference series at Sunken Diamond since 2009, when the Longhorns won two of three during — when else — the third weekend of the season. But if the Cardinal keeps its hitting up, Texas will be hard-pressed to pull that off again. Consistent production from the heart of the order has sparked Stanford’s current tear. The Cardinal’s 2-5 hitters, juniors Danny Diekroeger and Brian Ragira, senior Justin Ringo and sophomore Austin Slater, are all hitting above .320 and have combined for 18 of the team’s 31 total RBI. But that success by regular contributors has proven contagious. After a slow start to the season, highly touted freshman center fielder Johnny Locher finally notched the first three hits of his Stanford career in Tuesday’s 7-2 win at Saint Mary’s. Junior shortstop Lonnie Kauppila is riding a three-game hitting streak after going hitless in the team’s first five games and some depth has emerged at the catcher position, where weekend starter Wayne Taylor and midweek replacement Brant Whiting have combined for five hits in the Cardinal’s last two contests. Head coach Mark Marquess is still exercising his options at the left fielder position, where Stanford starters have accounted for just two hits in eight games. That’s a significant drop-off from recent seasons, when sluggers such as Tyler Gaffney and Stephen Piscotty — who signed with the Pirates and Cardinals respectively after their junior years last June — patrolled the leftfield grass. The Cardinal’s pitching, on the other hand, hasn’t dropped off one bit this season. Stanford has posted a 1.76 team ERA since its opening-weekend series loss to Rice. 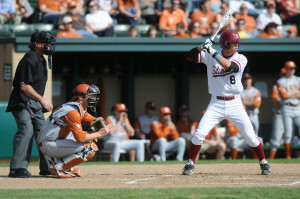 Senior ace Mark Appel dominated the Longhorns at Sunken Diamond in 2012, taking a no-hitter into the fifth and eventually striking out 10 Texas batters in Stanford’s 7-2 win. Then-freshman John Hochstatter was also impressive in that series, scattering five hits over 6.1 innings in a 15-1 Cardinal triumph. With both hurlers coming off their best starts of the young season against Fresno State a week ago, Appel and Hochstatter will duel with Longhorn sophomores Parker French and Dillon Peters on Friday and Saturday, respectively. The only real intrigue on the mound will come in the form of Stanford’s Sunday starter. The Bulldogs chased freshman lefty Logan James last Sunday from his second Sunday start, but classmate Bobby Zarubin mopped up by allowing just one run over 6.2 innings to earn his first career win. This early in the season, expect Marquess to ride the hot hand and reward Zarubin with his first start after two dominant relief performances. Stanford’s staff will face a middling Texas lineup that has averaged 4.25 runs per game this season. The Longhorns are led by a pair of juniors, right fielder Mark Payton (hitting .536) and third baseman Erich Weiss (.321), though freshman shortstop C.J. Hinojosa (.385) has made an impact early in his career as well. Much like the Cardinal’s, Texas’s pitching has carried the team in the early going. Four of the five starters have an ERA of 2.53 or better, and weekend hurlers French, Peters and junior Nathan Thornhill have averaged just over six innings per outing. The squad’s two series wins have come against unthreatening Sacramento State (4-4) and Nebraska (0-7), so just as Stanford’s bats will be looking to have a solid series against the well-regarded Longhorns, Texas’s staff has the chance to prove itself as a true shutdown unit for the first time. Tonight’s opener pits Appel (1-1) against French (2-0) at 5:30 p.m., with the Saturday and Sunday games beginning at 1 p.m. KZSU will broadcast the three games and The Daily will liveblog tonight’s matchup starting an hour before the game. Contact Joseph Beyda at jbeyda “at” stanford.edu.